For those who are wondering what is involved in setting up a simple display and sump I've included some pictures of my latest project and No... this isn't the only way to set up a display/sump but the component parts are basic to most systems. 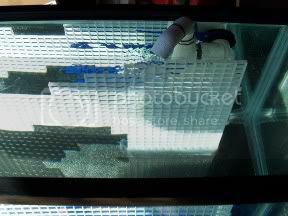 Most of these first pic's were taken after the tank was filled with water for testing. I have not included the construction techniques involved as they are the same as those discussed in my 75G. building project thread. There is a link to this at the bottom of the post. Basically, in this thread, I just wanted to show how things were put together. Here is a picture of my 33G. 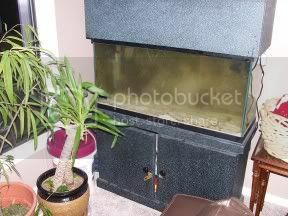 tank after it was dismantled to create my 75G. At the time I wondered what would become of it. Well, I needn't have worried, a client has purchased it and asked me to set it up for her. The first thing we did was to develop a plan. She wants a low - mid light tank with mostly soft coral/mushrooms/polyps and some hardy inverts and fish. Praise be she also agreed that a protein skimmer was a must (she wants the best for her livestock). She also wanted a very simple system. She is willing to perform the routine maintenance that goes along with S.W. but her main interest is with the livestock - not the mechanics. So this is really the proverbial "low light, low tech, low cost, beginners S.W. tank." The second issue was some design considerations regarding the stand. The cabinet is divided by a weight bearing wall and only 19" high so the sump and skimmer had to be small. After hunting around I found an ASM clone skimmer that was 16" high and a 5.5G. tank that just fit inside the cabinet. 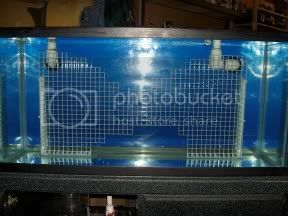 Yes, I could have had a custom sump made but for this size of display it would have been pricey and would have gained, perhaps only 3 - 4 gallons more. I took the tank to my LFS and had it drilled in the back for 2 - 1" bulkheads. The display drain (shown here) is a simple elbow with a riser set to the water level I wish to attain. A mesh cap (not shown) will keep livestock out of the hole. The return line (shown here) is a simple 1/2" pvc line with some elbows in. I like to keep the return line outlet at the desired water line so that (should there be a pump failure) a reverse syphon won't drain the tank. This is rather important in this case as the sump will only hold 5.5G. 's of water in total. 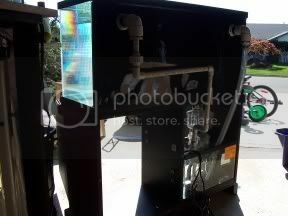 This shot shows the back of the tank, in particular, the plumbing of the drain and return lines. For the display drain line I used a 3/4" flexable hose. I did this because, at that point, I wasn't sure where the other sump features would go. The return line is 1/2" PVC with two important features. The first is a union (this allows the pipe to be seperated) just below the bulkhead. The second is a gate valve, just above the return pump (this allows the flowrate to be adjusted). Here's a view of the sump. 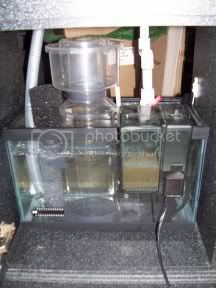 All it really needs to do is house the skimmer and the return pump. The gate valve (red handle) for the returnline is plumbed so that it can be adjusted from the front. 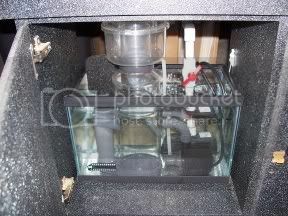 And this view shows how an A.C. filter will fit on the front of the sump. 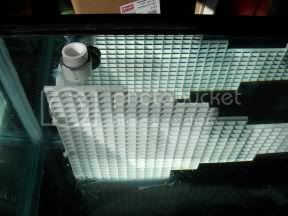 The filter will help to reduce detritus, the skimmer will help to reduce D.O.C. 's and a decorative form of macro algae Gracillaria, grown in the display, will help to control nitrates... well, that's the plan anyways! So, this stage of the project is complete. 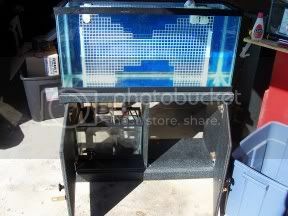 Now I will tear down the tank and set it up at the clients. The next post will cover the placement of the Liverock.